I hope that you are all doing fine. 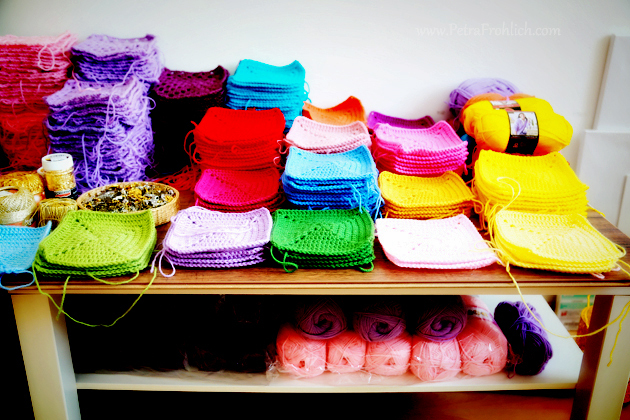 I am confirming that I am still here, and crocheting… Always! 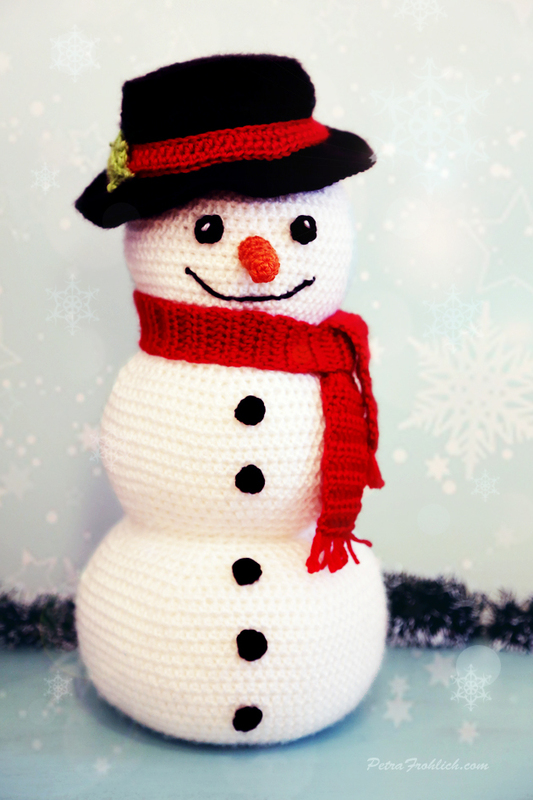 Actually, I would like to show you my latest creation, a crochet snowman. Ta-dah! 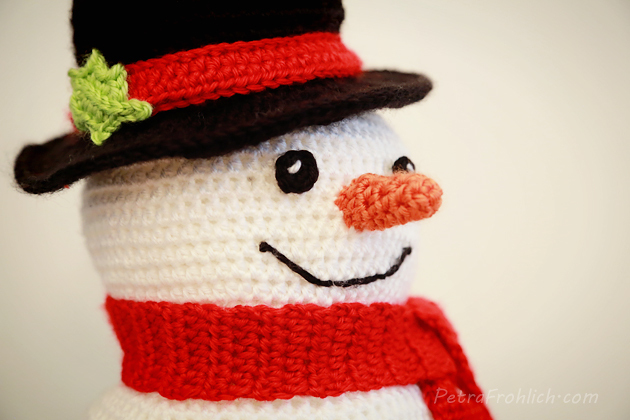 I’ve had this snowman kind of idea in my mind for quite some time, I think I’d even mentioned it in one of my posts here on this blog a couple of years ago, posting a picture of a snowman just being made… Well, that one never got finished, just until now. 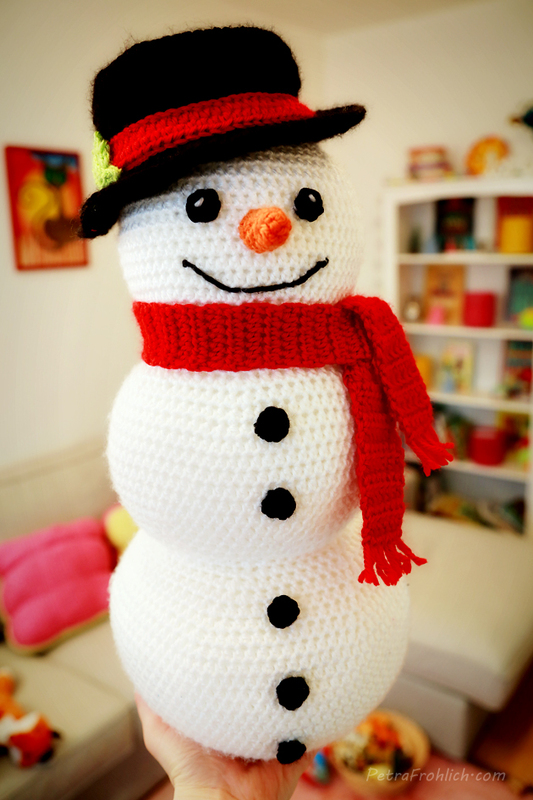 Having a little boy now, I thought it could be sweet to make something unique for him this winter. So, a snowman was born. My plan was to make it rather tall. Using an Aran weight yarn (Red Heart Soft) and a 4.5 mm hook it turned out to be almost 18 inches (45 cm) tall. In case you wonder about the pattern… I do have it written down on paper, I just need to make slight changes, transfer it to my computer, take step-by-step pictures… and then I will surely share it with you. Once it’s all done I will let you know here on this blog. I am wishing you a lot of peace and joy during this beautiful time of year. 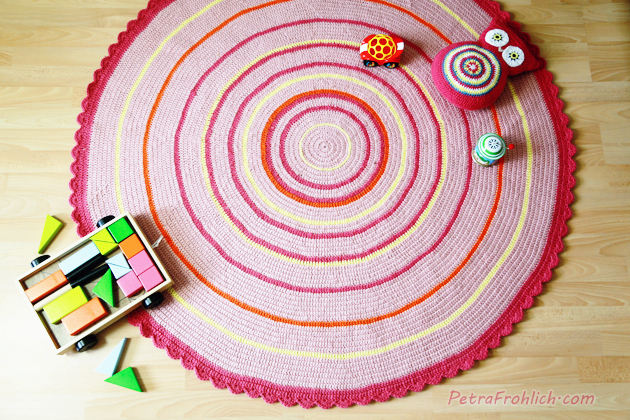 With this and this happy project under my belt, I am super-excited to share with you another thing I made, my newest darling, the crochet round rug. Anyways, I had been planning to make a big area rug for quite some time. The only thing that was holding me back was the fact that I did not really know how to prevent the rug from slipping (with a little baby in the house, that was my top priority). This issue was miraculously solved one day when I stumbled upon this Ikea product. 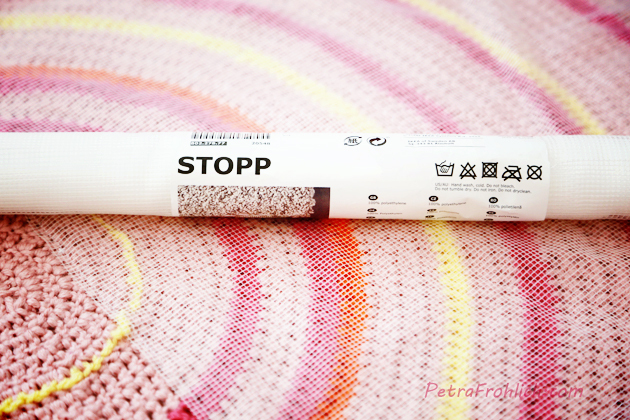 The Stopp unti-slip underlay keeps the rug in place, which reduces the risk of slipping and makes it easier to vacuum. Awesome, huh? 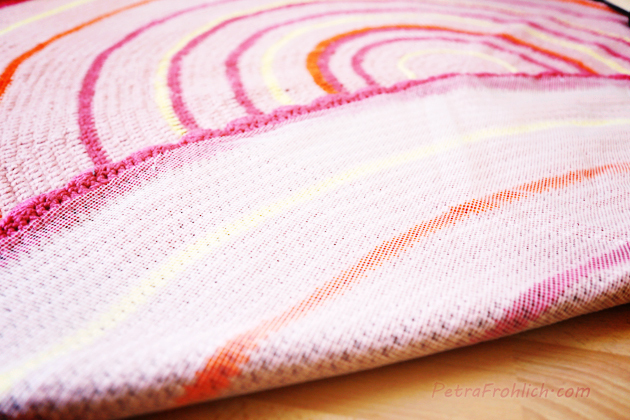 I used bulky yarn (this, this, this and this) and 6 mm crochet hook (J-10). In Round 1, I made a magic ring and crocheted 13 double crochet stitches into it. Note: If you’d like to make your rug with single crochet stitches (US), starting with 6-8 stitches is recommended in round 1. 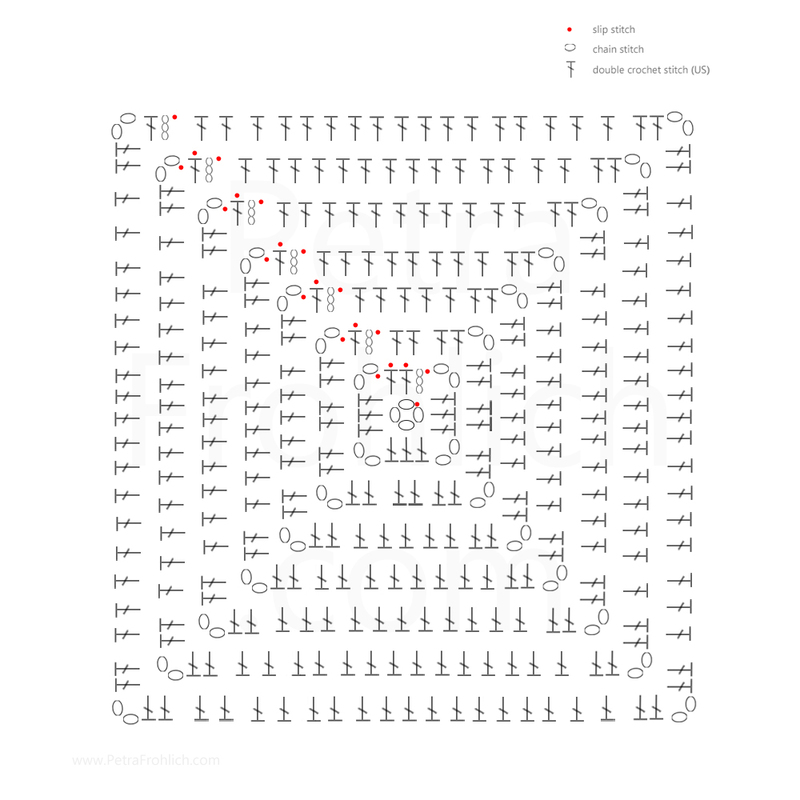 If you’d like to make make your rug with half double crochet stitches (US), 10 stitches are recommended. Round 2: Make two stitches into each stitch of Round 1. Round 3: Make two stitches into the first stitch of the previous round, one stitch into the next. Repeat this pattern. Round 4: Make two stitches into the first stitch of the previous round, then one stitch into the next two stitches. Repeat all the way around. Round 5: Make two stitches into the first stitch, then one stitch into the next three stitches. Repeat this pattern all the way around. You now see a pattern emerging. In every round, the number of stitches between increases increases by one. 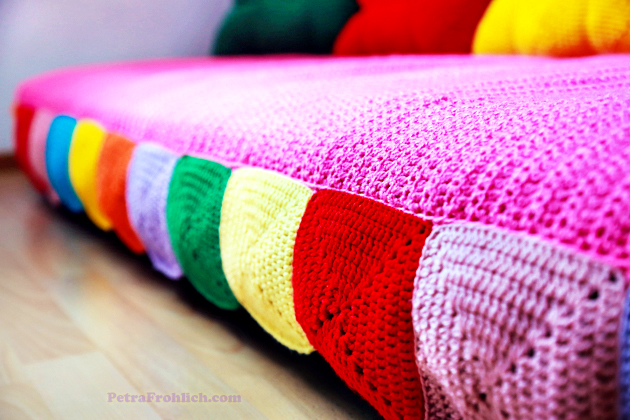 To continue making your rug, increase the number of stitches between increases by one. My rug has 53 rounds. And then the scalloped edging as Round 54. 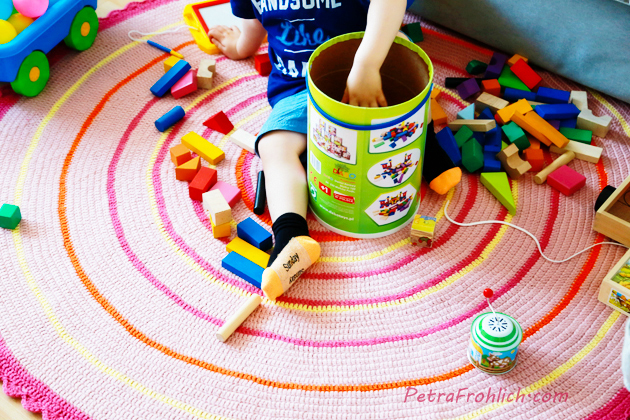 Tip: If your rug starts to WAVE, that means you have too many stitches in the last round. To help that, make one round without any increases. If your rug starts to look like a BOWL, that means that the number of stitches in the last round is too little. To help that, make one round with double the amount of increases. I ended my round 53 with 570 stitches (I think I officially ended with 571 stitches but since I needed to have a number of stitches which would be dividable by 6 to make the edging work, in round 53 I ‘got rid’ of 1 stitch by making 1 dc decrease in two last stitches. It is not noticeable at all). To make the edging I made this: ‘6 double crochet stitches – chain 1 – skip 2 stitches – 1 slip stitch in following stitch – chain 1 – skip 2 stitches’ and then continued repeating it all the way round. And that pretty much concludes how the rug was made. And here it is in full action. 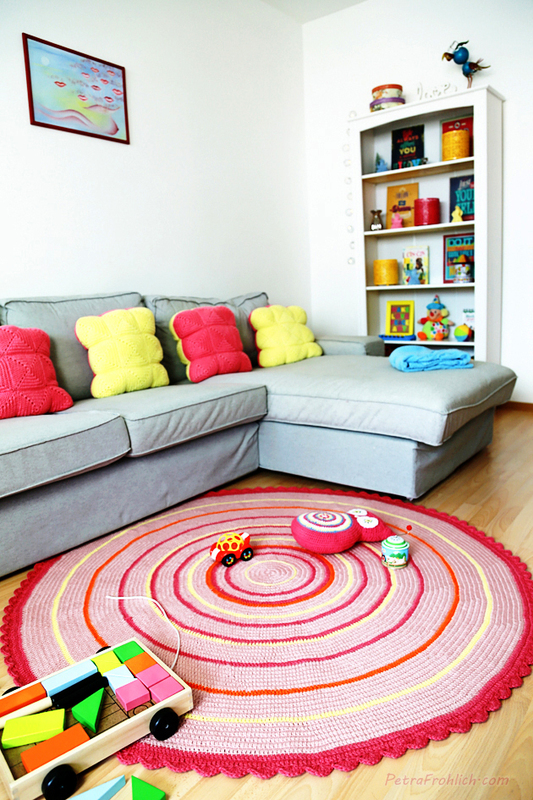 The round rug currently resides in our living room, serving mostly as playing headquarters. After sewing the unti-slip underlay to the underside of the rug, it works just like a charm. Today I am super happy to present my newest project to you. It’s a thing that’s been keeping me blissfully busy for the past few weeks. 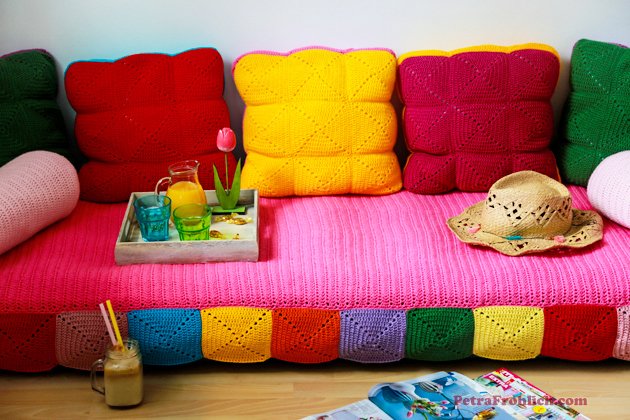 A crocheted airbed cover and cushions for my office nook. What I had in my mind while putting this together? And what’s the whole story behind the project? And that’s where the second part of the story comes into play. 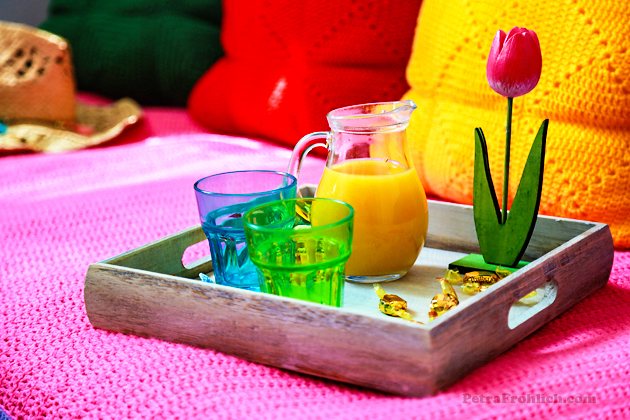 I realized that the columns of colorful crocheted squares that had been lying on my table ready to be made into a blanket could be actually used for something else. A new bed cover. A circus-extravaganza bed cover. 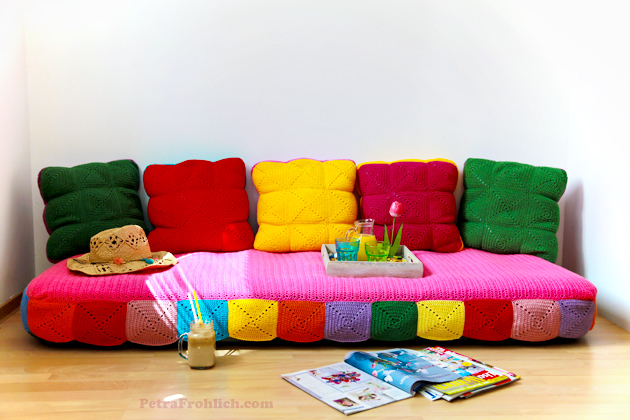 The whole project was very easy to make – the main pink part is made of rows of double crochet stitches (US terms). And then there are loads of solid crocheted squares that were attached to the main pink part (I joined the back stitches only). 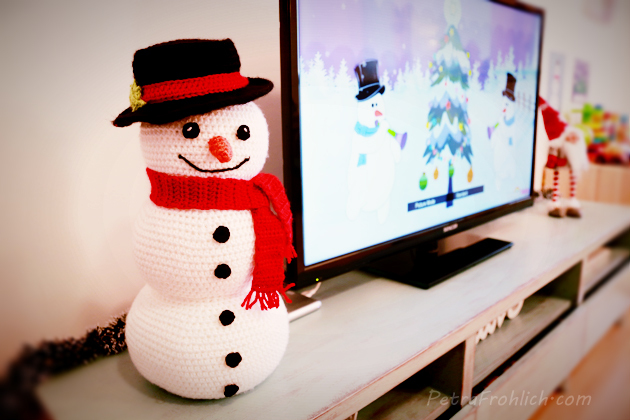 The yarn that I used is called Red Heart – Lisa and I used a 3 mm crochet hook. I made the squares following this pattern. Frankly, I was so looking forward to sharing this project with you! It makes me so happy, I hope the colors will bring a little joy into your day too. I am sending you my warm Sunday greetings! May your day be lovely, happy and blessed. We have been spending our Sunday mostly outside (oh my goodness, the weather has been marvelous over here in the heart of Europe, so INVIGORATING). And I was lucky enough to find me some precious moments and hide myself in my ‘office’ (a.k.a. 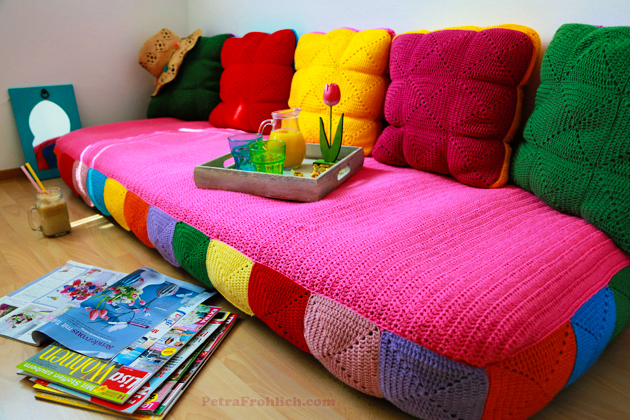 Happy Room) where I enjoy spending my time hidden behind columns of colorful yarn squares. The bliss! Things of various crochet kinds have been going on here recently, I have been happily working on a couple of projects and I am eager to share more as soon as there is some significant progress achieved.